We eat a lot of chicken in our house but only prepare it a handful of different ways. Marinated in Italian dressing and grilled, BBQ'd with a little sauce, breaded with Italian or panko breadcrumbs and pan fried or hubby's personal favorite, Shake n Bake (yuck). As I was flipping through Dorie Greenspan's Around My French Table and honed in on a new chicken preparation. Chicken Diable. Shallots, garlic, wine and dijon mustard lured me in. Chicken Diable is thinly pounded out chicken breasts lightly salted and peppered and pan fried in a bit of butter and olive oil. The chicken goes into a 200 degree to keep warm while you whip up a quick sauce. The sauce is really easy and most importantly it's delicious! For the sauce saute 1 medium finely chopped shallot and 1 finely chopped clove of garlic in the remaining olive oil and butter in the pan you cooked the chicken in. Season lightly with salt and pepper and cook for about 2 minutes. Pour in 1/3 cup white wine and bring to a simmer for about a minute. Add 1/2 cup heavy cream and return to a simmer. Then stir in 3 tablespoons of dijon mustard (I only used 2) and 2 teaspoons of Worcestershire sauce until heated through. Add additional salt and pepper if needed. Remove from heat and spoon sauce over chicken. 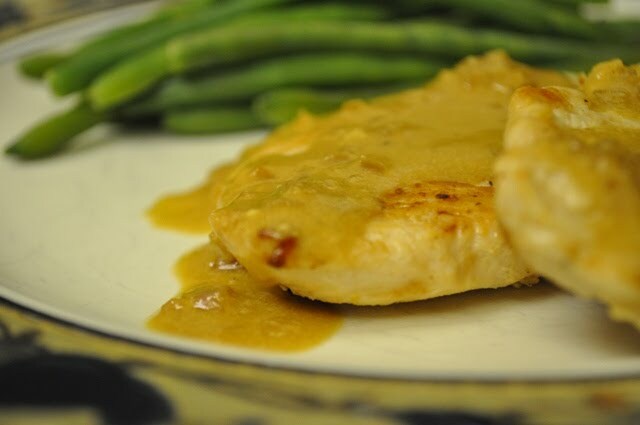 The sauce is rich and velvety with a hint of dijon mustard and garlic and shallots in the background. It's definitely on my repeat recipe list. Though Hubby didn't love it...but I guess he can just eat chicken sans sauce. 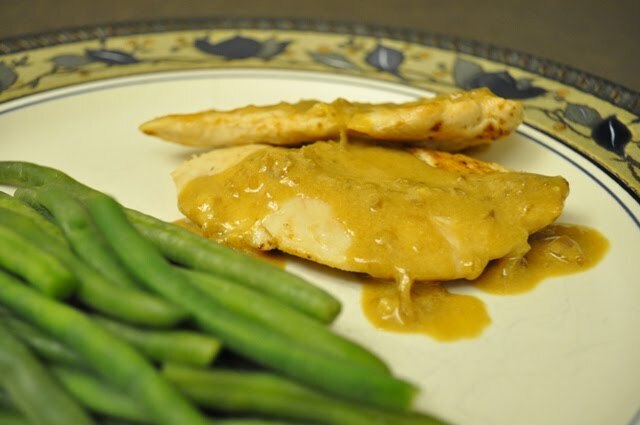 I can't emphasize how easy this mustardy gravy is. Easy and tasty. Sounds like a winner to me.